While I am not sure I have earned the title of a jet setter quite yet, I do think I have established a little bit of a frequent flyer status over the past year and a half or so. When you travel by plane, you are faced with some unique challenges and restrictions. After a few flights in as many months, you realize that you would like just to streamline everything as much as possible to make getting to your gate and boarded on your flight as quick, painless, and smooth as possible. I figured out that I hated juggling a large rolling suitcase through the airport parking lot to the shuttle while also lugging a laptop bag and a tote or purse on one shoulder. I discovered that purchasing a bottle of water once you made it out on the other side of security gets pricey. I found out that sitting towards the back of the plane is well, noisy and loud. And I figured out just what I needed to change and bring along with me to avoid all of these inconveniences of flying that I found irritating. 1. Koolerton Waterproof Vintage DSLR Camera Bag: (approx. $37.99) I personally own this camera bag and love it! I would definitely say it is more for weekend trips when you know that you will snapping a lot of photos, but don't want to bring along a separate purse. This bag is stylish enough to double as a purse while out and about. It has a well protected insert with enough room for your DSLR and 1 lens, plus it has front pockets and a space inside for storing essentials like your wallet, cell phone, keys, and a lip gloss. 2. Shure SE215-K Sound Isolating Earphones: (approx. $89.00) Whether you are sitting towards the back of the plane, have a chatty neighbor on the flight, or just want a little peace and quiet on your flight, a pair of noise cancelling earphones are a must. 4. Bagail 4 Set of Packing Cubes: (approx. $19.99) These packing cubes are great for the organized suitcase packer! I actually used this set on my last trip and loved that I could keep everything separated in their own little cubes. I used one for pajamas, another for undergarments, another for dressier clothes, and so on. 5. Vlando Travel Jewelry Box Organizer: (approx. $9.99) Who else ends up tossing all their jewelry into a cloth pouch or ziploc bag when packing? Raises hand. Well, no more! Keep your earrings, necklaces, rings, and bracelets organized and protected in this space saving travel jewelry box. 6. 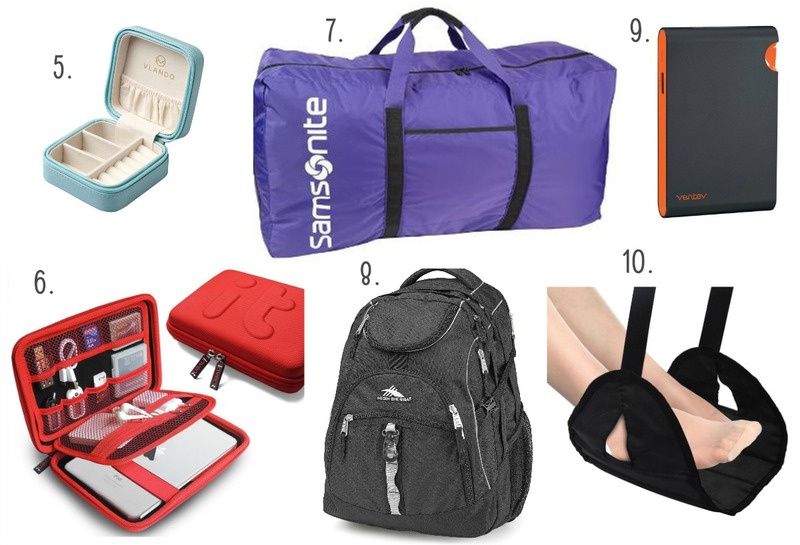 Electronics/Tech Travel Organizer: (approx. 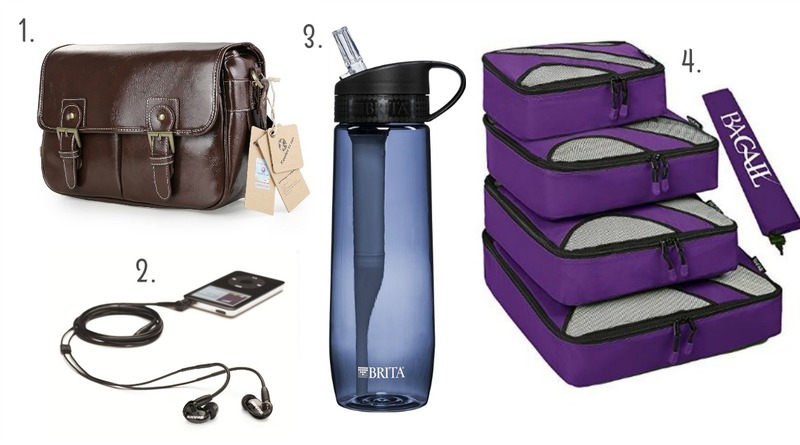 $14.99-19.99) Travel tech organizers are the perfect gift for the traveling techie! If you or your favorite frequent flyer can't board a plane without having your iPad, cell phone, Kindle, etc close at hand, then a hard cased all-in-one organizer for all those gadgets, cords, and adapters is a must for that carry on bag. 7. Samsonite Tote-A-Ton Foldable Duffel Bag: (approx. $24.99-34.99) If you often find yourself limiting your shopping purchases once you get to your destination because you lack the suitcase space, then a foldable duffel bag will become your new best friend. ;) It lays flat in the bottom of your suitcase taking up very little space, but leaving you totally prepared in case you need to check a second bag thanks to all of those souvenir purchases. 8. High Sierra Access Backpack: (approx. $39.68) This backpack has literally replaced both of my carry on bags! It is roomy and has a special tech sleeve just for your laptop (up to 15 inches). I usually toss a foldable tote into it, so I can take out any snacks, magazines, or books I would like to keep within reach during my flight. This backpack fits perfectly in the overheard compartment even when I have it stuffed full with my laptop, DSLR, jacket, etc. 10. Airplane Portable Footrest: (approx. $9.99) So this one is totally a novel indulgence, but I can't tell you how many times I struggle to get my feet and legs comfortable during a longer flight. There aren't places to comfortably prop your feet on a standard flight, am I right? That is where this portable footrest can come in handy! It actually attaches to your tray table and easily slips into your carry on. 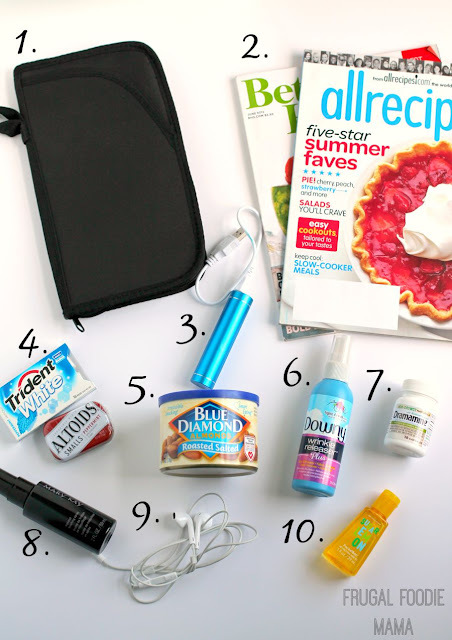 What is your favorite accessory or gadget to have with you when traveling by plane? Are you buying for a frequent flyer this holiday season? 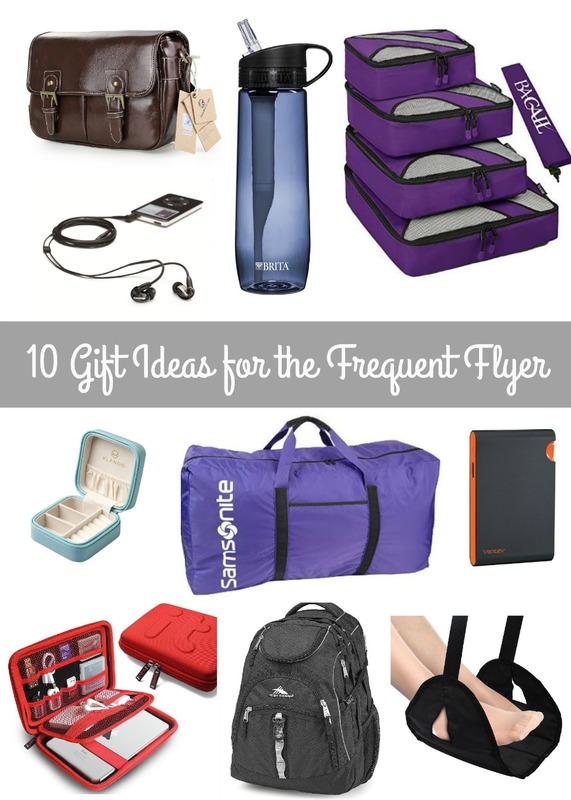 And be sure to also check out my friend Keryn's from Walking on Travels Ultimate Gift Guide for Travelers 2016 and my gal Rachelle's (from Food. Travel. Fun.) 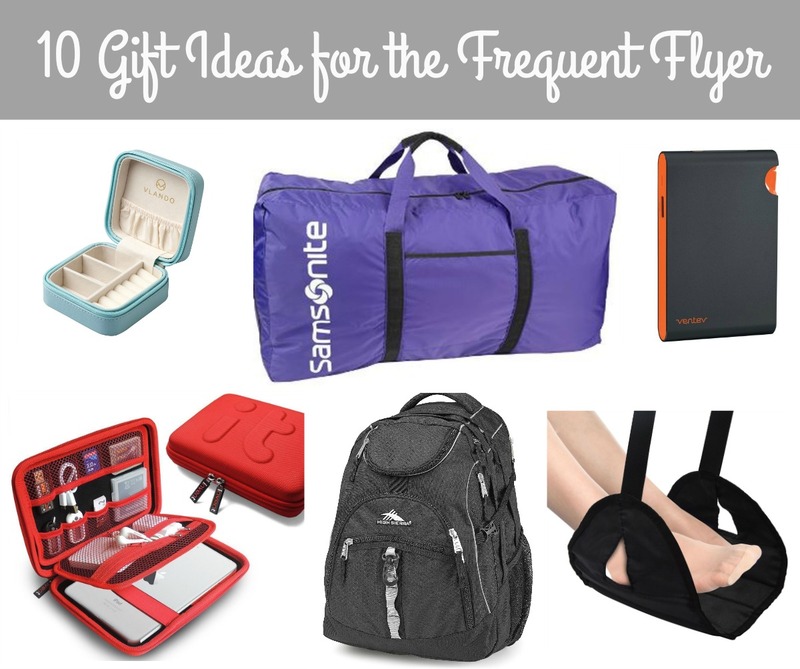 Best Gift Ideas for Travelers post!